Since getting a puppy over a month ago all I can say is....I'm tired. No here's the thing, puppies are cute, but they are a lot of work. It's like parenthood on speed. You only have a few short months before the puppies are full grown and full of bad habits. If anything, my puppy is making me appreciate how much more time I have to make up for all the mistakes I make with my kids. But all of it is a lot of pressure. And really, I didn't need more pressure. I didn't need yet another reminder that I don't have it all together. And that's what having my puppy can feel like sometimes, like the sometimes when I'm trying to get all the kids out the door to school and she pees on the floor. Or the sometimes I'm reading a story to Wade and she whimpers and whines that no one is on the floor with her. Honestly, I was at my wit's end, ready to wave my white flag and give up. I was ready to admit to what a lot of people were thinking, I couldn't handle four kids and a puppy. Waaaa. 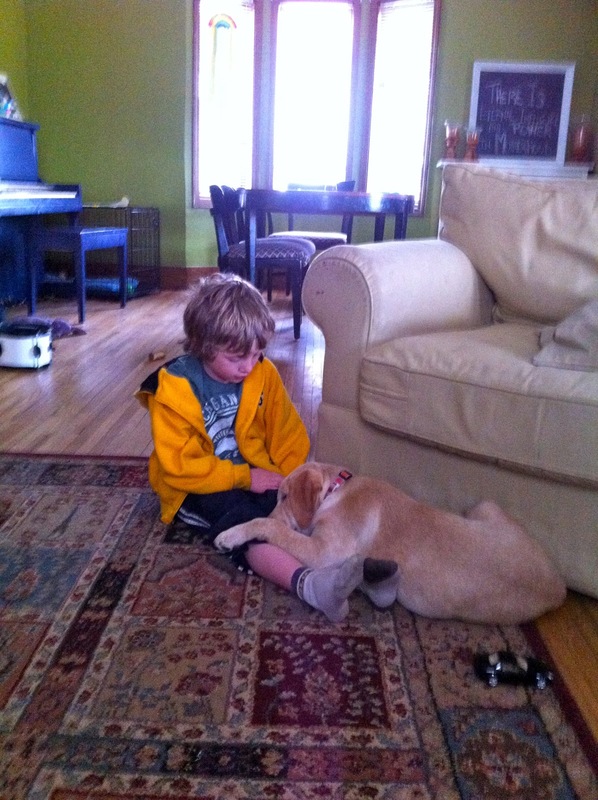 But then, I watched my kids with our little puppy Cosi. I put my flag away and committed to raising this puppy. Because Cosi is part of our family. Honestly, she fits right in with us. Thankfully no one else is peeing on the floor, but we are all trying to get attention, be loved, show love, enjoy life and be a part of everything just like our little puppy. To make it easier to remember why I love my sweet little Cosi, I will be doing a monthly Puppy Love Post. A post where I share a warm and fuzzy story about Cosi. A post with a sweet picture. I mean, puppies/dogs in general could use more space on the kitten/cat-obsessed-focused Internet. "That boy is snake bit," my husband said the other day sounding like a character from a 1950s coming-of-age cowboy novel or movie. He was referring to our son JT and what he said is a little bit true. If something bad happens in our family, it usually happens to JT. Autoimmune disease? Check. Broken arm while picking strawberries? Check. Speech delay? Check. Being in the wrong place at the wrong time when your baby brother is swinging a curtain rod wildly and it hits your head? Check. Concussion after the basketball game? Check. And I could go on and on. JT is also the kid in our family who has connected most to Cosi. When he gets home from school he tells her he missed her. 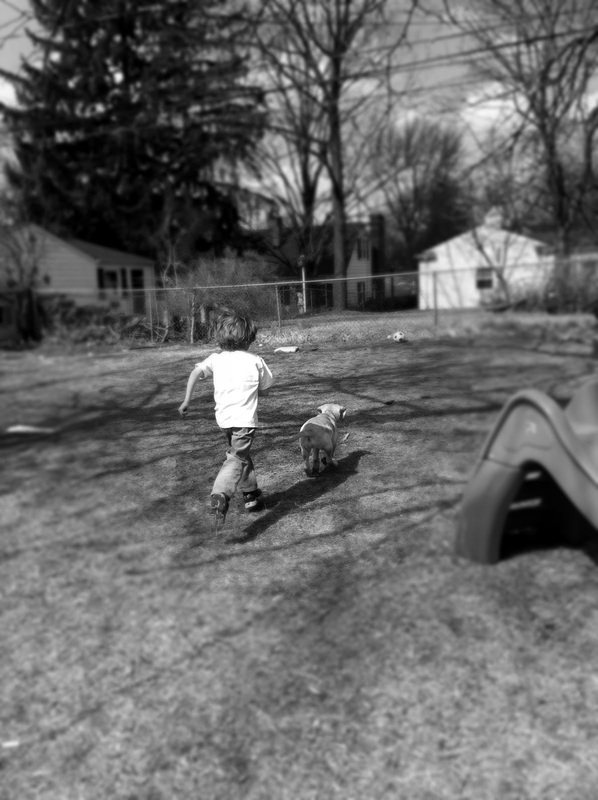 He plays catch with her after the other kids have had enough and go inside. He hugs her good-night before heading upstairs to bed. 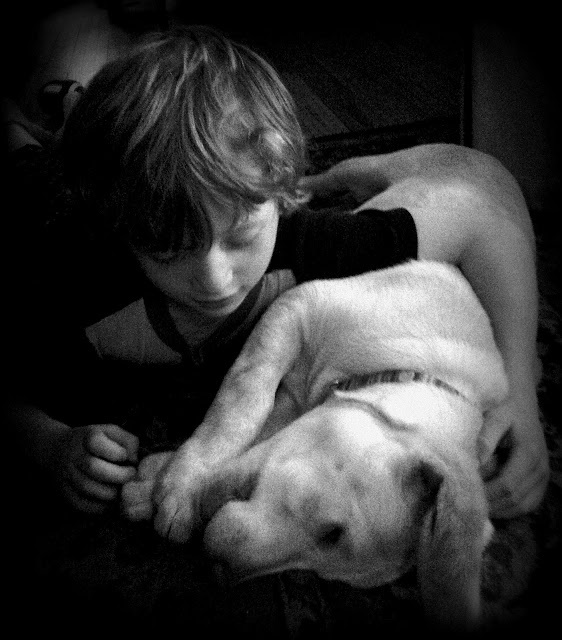 In some ways, the story of JT and the puppy is like a 1950s book. It's a story of a boy and his dog, loyal pals. I love that even though he might indeed be a little snake bit, he's always got somebody (else besides Tim and me) in his corner giving him unconditional love. 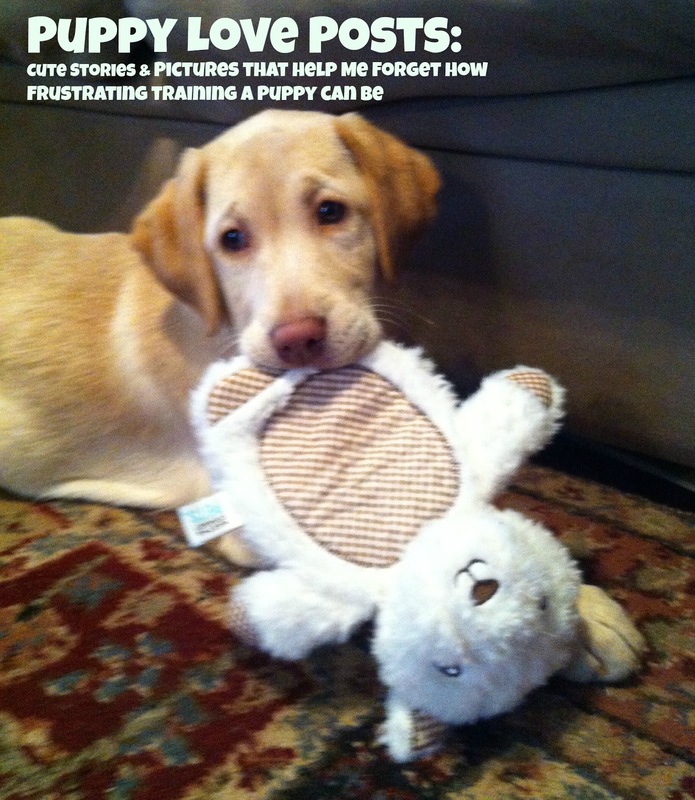 Got a puppy story? Want to share? Let me know if you'd be interested in sharing your Puppy Love Post. Leave a comment or send me an email to youngbloodsix@yahoo.com. Ah yes.. puppy land.. we are there again this year ( Delilah- 10 weeks) and were there last Summer ( Albus 10 months).. add to that THREE other dogs..yes I have crazy going on all over the place. It can be crazy making at times but our secret is very strict cage training.. the puppy is NOT allowed to roam the house - ever.. she is in her cage, or playpen, or on leash or right with us... we don't give her any chance at an accident. We put bells on the doors and teach them during this time to ring to go out and there is a strict schedule for eating, playing pooping and sleeping. That is so sweet...Essie is like that with our kittens. I'm glad that you're not waving the white flag, but I COMPLETELY understand why you wanted to! Thanks for this - I have a serious case of puppy love, as you can see!